An uncluttered distraction free workspace. 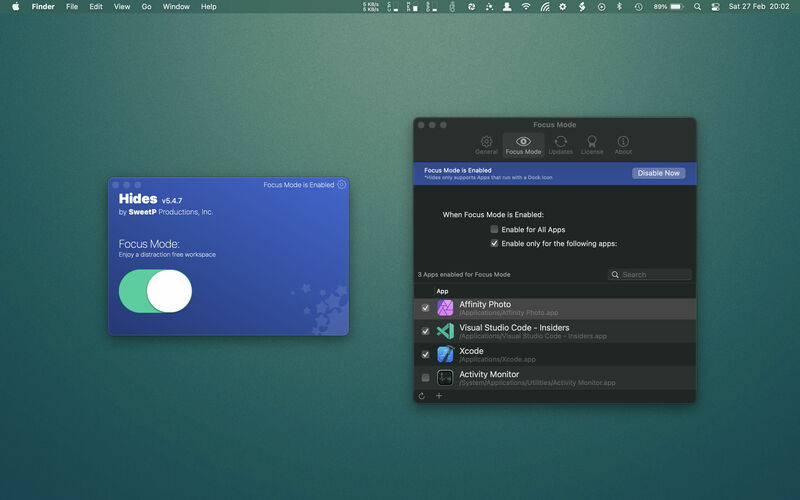 Focus Mode enables you to quickly hide all apps except the app you're currently working in. Once enabled, let Hides take care of business, so you can work. Focus mode helps you to target your attention on what is directly in front of you! It can be configured globally or for specific Apps, and is super easy to enable or disable. It's not enough that Hides is super useful, it also has to be user friendly. 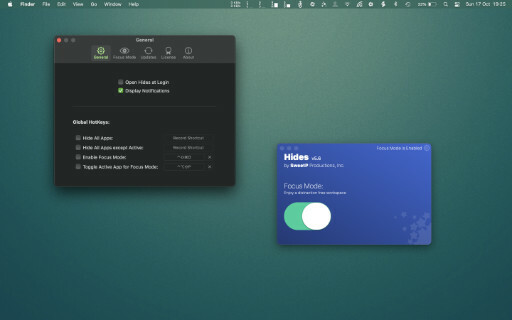 It's a breeze to configure global keyboard shortcuts for all the main features. Once you've configured Hides just the way you like it, you'll never need to open it again! Hides does one job, and does it well. There's no bloated features getting in the way. So it's never confusing, and it just works. Just the way all good software should be. It sits up in your menubar, waiting to get to work. But don't worry, it's not consuming resources. There's only one button - super easy! Important functions are only a keystroke away! Sometimes its hard to focus on your work. 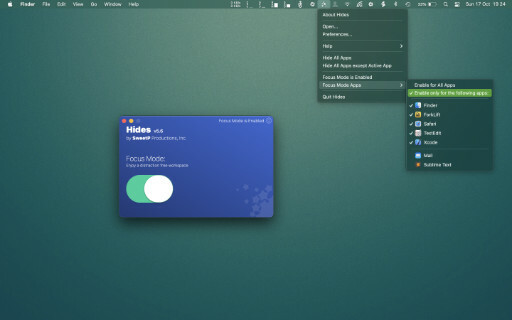 Hides can quickly and effortlessly remove distractions from your desktop without any intervention. Look like something you want? Great, Buy it for only $9.99 using the buttons below. Alternatively take Hides for a free 2 week test drive and see if it fits your needs. Just click the Try it button below. Head on over to our main site and check out some of our other great Apps, or for Hides support.